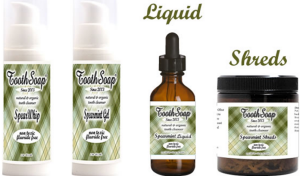 Tooth soap is the product that replaces the usual toothpaste products with far more natural, gentle teeth-washing ingredients. 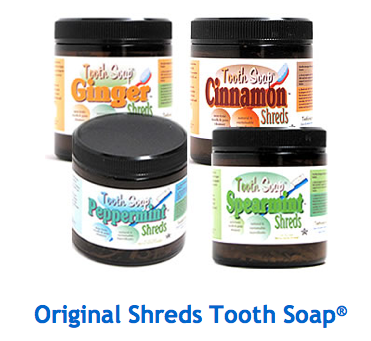 Because let’s face it: You don’t actually need to “scrub” your teeth with sand, chemical preservatives and sweeteners. Some toothpaste products are quite harmful — they’re loaded with synthetic chemicals that simply can’t be considered safe for human consumption by any reasonable person. Cleaning your teeth only requires a type of soap, some water and some brushing action. You don’t need dyes, sweeteners, sand and other unnecessary ingredients. • Pure essential oil – a proprietary blend of peppermint, spearmint, cinnamon bark, citrus and ginger essential oils. 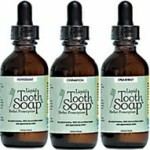 All of these forms of tooth soap are good and convenient products to use in our everyday lives. Gel is a sister to the Whip without the addition of Coral Calcium. Gel is smooth sailing on your teeth and gums and like the Whip, it is super concentrated and you only need a “pea sized” amount of Tooth Soap® to get the serious job of cleaning teeth and gums completed. The tooth soap whip is the premier Tooth Soap® that debuted in 2010, this one rivals any tooth cleanser currently on the market. 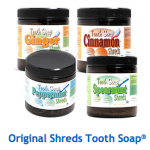 Tooth Soap® Whip is made with the finest natural and organic ingredients (as usual) plus the addition of pure Coral Calcium from the Caribbean. Tooth Soap®’s Coral Calcium is harvested from “above sea bed” coral fossils and the assay test shows it to be cleaner that that coming from Okinawa. Whip is a treat for your teeth and gums. With the new “airless and BPA free” pump you can be assured that you don’t waste one drop of this super concentrated Tooth Soap® Whip. Both of these products are used like any normal toothpaste, whereby they are dispensed on the toothbrush and placed into the mouth for brushing. 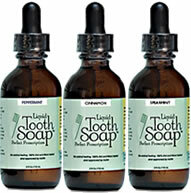 Before you add any tooth soap, wet your tooth brush and give your teeth a quick once over to get rid of any big bits of debris in between your teeth. Never put more than 2 drops of tooth soap on your toothbrush. Never talk when the tooth soap is in your mouth. Hold your tongue as far back in your mouth as you can, keeping it away from all of your teeth. Basically, pull your tongue back so it blocks the entrance to your throat. This is also a good way to stop you swallowing any. When you are ready to rinse tip you head over the sink and let the soap fall out of your month with gravity, do not push it out with your tongue. Even if you are in a hurry, remember to keep that tongue well back. Don’t use a glass of water to swill you mouth out, because that will involve tilting your head back sending the soapy water to your tongue. Instead keep your head over the sink and use your hand as a cup and slurp the water up and then immediately spit it out – that way it won’t reach the back of your mouth. Repeat this style of rinsing a couple of times. Once you’re confident you’ve removed most of the soap, then you can swill some of the water around your mouth, using a glass at this point is fine. The shreds, on the other hand, are small waxy bits of solid Tooth Soap that dissolve into soap when you start to chew on them gently and start brushing. So you put one in your mouth, chew on it a couple of times, then start brushing with a wet toothbrush. It immediately starts foaming up, generating an astounding volume of cleansing soap right in your mouth. It’s very easy to use, and it really works! These shreds are also perfect for traveling as they are small in size, easy to store, and will not leak accidentally. However, it must always be remembered that Tooth Soap® is designed to improve your dental check-ups, not remove them. And it is recommend that you always consult your doctor or dentist before starting any new medical or dental protocols. It is also recommend getting a good professional cleaning first, then maintaining those results by brushing regularly with Tooth Soap®. This entry was posted in Oral Care, Toothpaste and tagged cinammon, essential oil, gel, ginger, liquid, peppermint, shred, spearmint, tooth soap, whip on September 15, 2011 by chzechze.